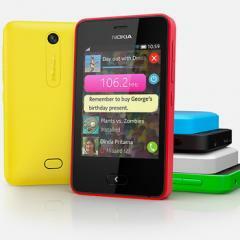 Nokia will launch its Asha 501 smartphone in Thailand and Pakistan this week. The company said that the usability of the Asha 501 is simple, fast and intuitive. The Asha will have two main screens: Home, which is the main application launcher; and Fastlane, which displays recent activity along with upcoming events, multi-tasking options, and integration with Facebook and Twitter. The phone is available in a number of bright colors and will feature a removable shell and scratch-resistant, tempered glass display.